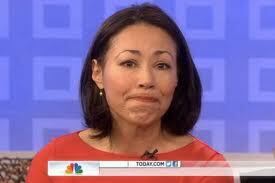 I just watched Ann Curry’s tearful farewell segment on the Today Show and it got me to thinking about the impact crying in public has on women professionally. Given the circumstances surrounding Ann’s unexpected departure, her tears seem to be a poignant moment in a difficult situation and therefore understandable, if not actually an appropriate show of emotion. However, I think the general consensus is that crying in the workplace for women, or certainly crying in front of male colleagues, is still considered a big no-no. In this regard, I was fortunate to have spent much of my professional life working for women. My very first job out of college was working in a small team that was headed by a female director and two female assistant directors; after moving to Seattle I worked for a company that was founded by a woman and the entire leadership team was comprised of women. In those instances where I cried, my tears were not regarded as anything more than a momentary display of emotion. And I’m not really making any particular comment about the pros and cons of working for women leaders – I have had both amazing and horrible bosses of both genders. But when it comes to the water works, I’d rather, well, do just about anything else humanly possible, than have a break down in front of a male boss (or even a male colleague). Women simply seem to have the ability to put the tears in context and not give them any more or less credit than they are due. I do recall one instance very early in my career where I broke down in front of a male boss and the entire nature of our relationship changed. I seemed to have lost some fundamental level of respect in his eyes and much of his interactions with me ever after seemed to be calculated to avoid me ever showing any emotion. He tip-toed around any and every topic he thought might be considered “sensitive.” Fortunately, I did not have to work for him for very long (he left the company, I stayed for almost 14 years…). She also shares UC-Davis professor of management Kim Elsbach’s findings that many women have reported feeling ashamed of showing emotion in the workplace and that it has cost them professional advancement opportunities. And she cites a study by Anne Kreamer that women at all professional levels have reported crying in the workplace, therefore it’s not an instant career killer. Anne-Marie Slaughter tells us in Why Women Still Can’t Have it All about the challenge of trying to balance family and career; not crying at work, but fundamentally she is pointing to the sacrifices many women have to make in order to achieve success. They take two years off when their kids are young but then work like crazy to get back on track professionally, which means that they see their kids when they are toddlers but not teenagers, or really barely at all.” Her friend nodded, mentioning the top professional women she knew, all of whom essentially relied on round-the-clock nannies. Both were very clear that they did not want that life, but could not figure out how to combine professional success and satisfaction with a real commitment to family. But show that same emotion in the workplace and instead of a release, it’s much more often viewed as a loss of control. I guess the truth is that, factually, it is a loss of control. So, maybe the lesson to be learned is that not maintaining control 100% of the time is not necessarily a bad thing, nor does it equate to any less leadership skill. In any case, I go out of my way to avoid workplace tears. Not that I am always successful. There has not been a job yet where I haven’t succumbed to my emotions at least once (or at least once a year may be more accurate…). Using that as a measuring stick, a few tears now and then do not seem to have impacted my professional success in any discernible way, other than my own sense of being self-conscious. But I do look forward to the day when crying is treated the same as profanity in the workplace – to be avoided, occasionally necessary, but otherwise largely ignored.